The Sopwith Triplane - known to its Royal Naval Air Service pilots as the “Tripehound” - was developed from the biplane Pup in late 1916. The purpose of the triplane configuration was to maximize pilot view with narrow-chord wings and the maximize maneuverability by increasing wing area without increasing wingspan. The result was a supremely maneuverable single-seat scout that had such a profound effect on its opponents that they paid it the ultimate compliment of copying it - directing all German aircraft manufacturers to submit designs for triplane fighters within weeks of the appearance of the Tripehound over the Western Front in the Spring of 1917. The Triplane was generally about 15 m.p.h. faster than the Albatros D.III and could easily outclimb its opponent; if the German chose to attack, the Triplane could out-turn the Albatros quickly, then outclimb it, thus allowing the RNAS pilot to choose his moment of attack. Flown by such famous RNAS pilots as the Canadian Raymond Collishaw, the Australian Ace of Aces R.A. “Bob” Little, American O.C. “Boots” LeBoutillier, and Englishman Reggie Soar, the Sopwith Triplane went far to re-establish British air superiority in the northern region of the Western Front following the disaster of “Bloody April.” Powered mostly by the 110 h.p. Clerget engine, the fighter suffered from a standard armament of only one Vickers machine gun, though both Collishaw and Little flew a limited-production series of Triplanes armed with two machine guns despite the deleterious effect on performance from the extra weight of the additional weapon. Such was the pace of technical development that the Triplane, which had first appeared on the Front in February and only achieved widespread service in all of the four RNAS fighter squadrons - Naval 1, naval 8, Naval 9 and Naval 10 - by May, was considered obsolescent by late July and left front-line service by the end of August, 1917. Replaced by the tricky Sopwith Camel, the Tripehound was remembered by its pilots as a wonderful flying machine. It was far superior to the better-known Fokker Triplane, which suffered from only having ailerons on the upper wing, unlike the Tripehound which had ailerons on each wing and could fly rings around Fokker’s product. Eduard’s Sopwith Triplane first appeared in late 1995, and was the first Eduard kit to not be a limited-run product. 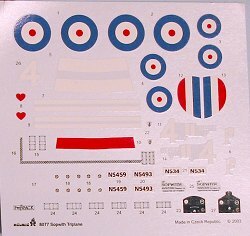 Originally released with the early “Pup” horizontal stabilizer, a limited kit was released in 1996 with decals for the famous “Black Flight” of Naval 10 squadron, and a resin horizontal stabilizer of the later shape. 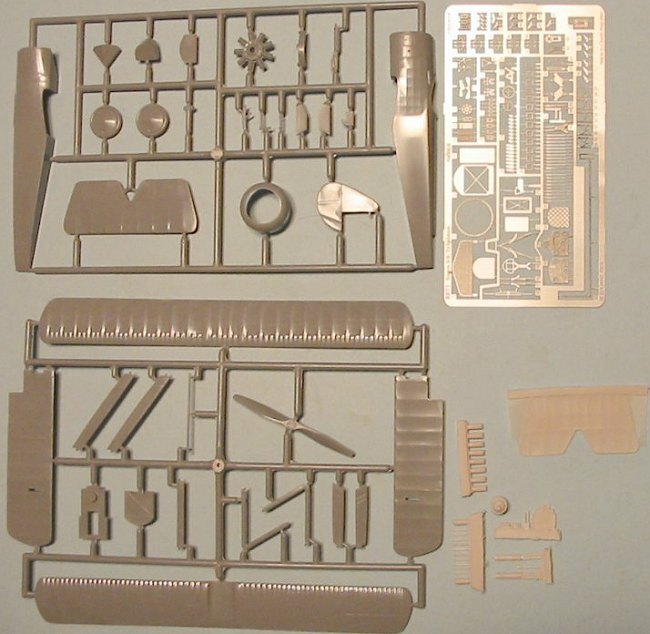 This re-release as a “Profipack” kit includes both the plastic and resin horizontal stabilizers, the single gun and twin gun mounts with machine guns in resin, photo-etch detail parts, an injected plastic engine and a more detailed resin engine. Decals are provided for four aircraft, including the Triplane flown by Australian Ace of Aces Robert A. “Bob” Little of Naval 8, though the name “Blymp” is not included for some strange reason. 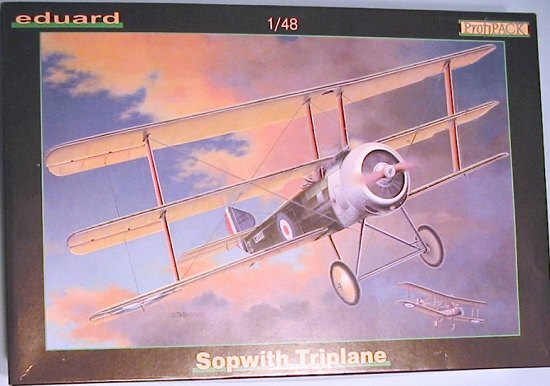 The Sopwith Triplane is one of Eduard’s best kits ever, and results in a very distinctive-looking model. As World War I kits go, it is not that difficult a project, and would be a good “step up” for a modeler with a kit like Eduard’s Nieuport 17 under their belt. Thanks to Eduard for the review kit. If you would like your product reviewed fairly and quickly by a site that has over 250,000 visitors a month, please contact me or see other details in the Note to Contributors.